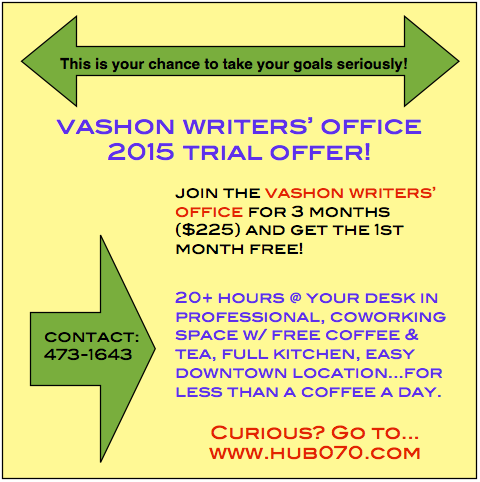 GIVE YOURSELF AN OFFICE FOR 2015! There comes a time in our life where we decide whether or not to take ourselves and our goals seriously. For me, it was August of this year. After four years of writing amid the chaos and jumbled distractions that is a farm with 2 teenagers, I discovered HUB 070 (our island’s own Coworking Office) and I dove in head first! and with a full kitchen – I’m eating healthier & saving money, too! Won’t you join me, in 2015? Bring your hopes, your calendar, your plans…and prepare to succeed!